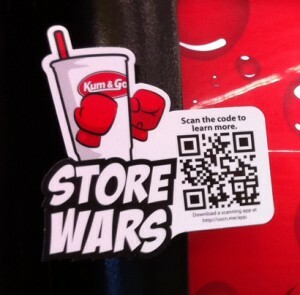 Earlier this year a convenience store retailer sought to create an engaging way to interact with customers for their summer promotion and got it right – QR codes. 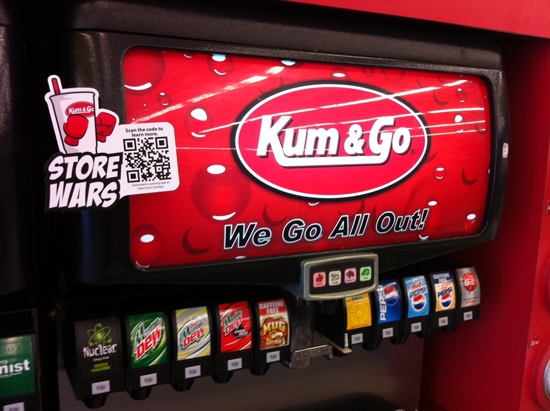 Kum & Go, a convenience store chain with more than 400 stores in 11 states throughout the Midwest, used a QR code above their fountain drink area that when scanned, directed customers to a mobile version of the summer contest site. The contest focused on which stores could sell the most fountain drinks and included a leaderboard that showcased daily results. Making sure customers had easy access to the contest site – allowing them to check on their store’s progress – was critical. The mobile site also gave customers a chance to win free gas for a year if they completed a survey. Since the campaign launched on May 1, there have been over 1,700 scans – averaging around 30 scans per day. “We know smartphones are not ubiquitous yet, but this example proves that many of our customers are very savvy when it comes to emerging technologies like QR codes,” shared Templeton. Thanks for inviting us to share our story, Veselin. It’s been fun to test QR codes on such a large scale, plus your tools made it easy to set up. I’m looking forward to what we might experiment with next. We are looking forward to work with you in future and deliver even more engaging QR codes to your customers.